Diplômé de Licence et Master de l’Académie des arts de Chine. Membre de l’Association des artistes de Chine, membre de l’association des artistes de la province de Zhejiang, représentateur de la zone Chine de l’Ecole internationale d’arts de Montils, membre de l’Association des artistes professionnels américains. Membre de l’Association des artistes de la peinture à l’acrylique, membre de l’Organisation worldwidekitsch. Membre de la Circle foundation.
. Accomplishments of Exhibition . - Year 2006 the oil painting "the Sea in My Heart" was selected to the First China's Art College Teachers' and Students' Oil Painting Exhibition held by China Artists Association and won the First Prize. - Year 2008 the oil painting "Spring Tide" was selected to be on display in the "the National Exhibition of Art Works: Commemorate of the 30th Anniversary of China's Reform and Opening", held by China Artists Association, and won the Excellence Prize. It was exhibited in the Guangdong Museum of Arts. - Year 2008 the oil painting "the Edge of City" and other series of graduate works won the Golden Prize of "LuoZhongliArt Scholarship", and was exhibited respectively in National Art Museum of China and Sichuan Art Museum. 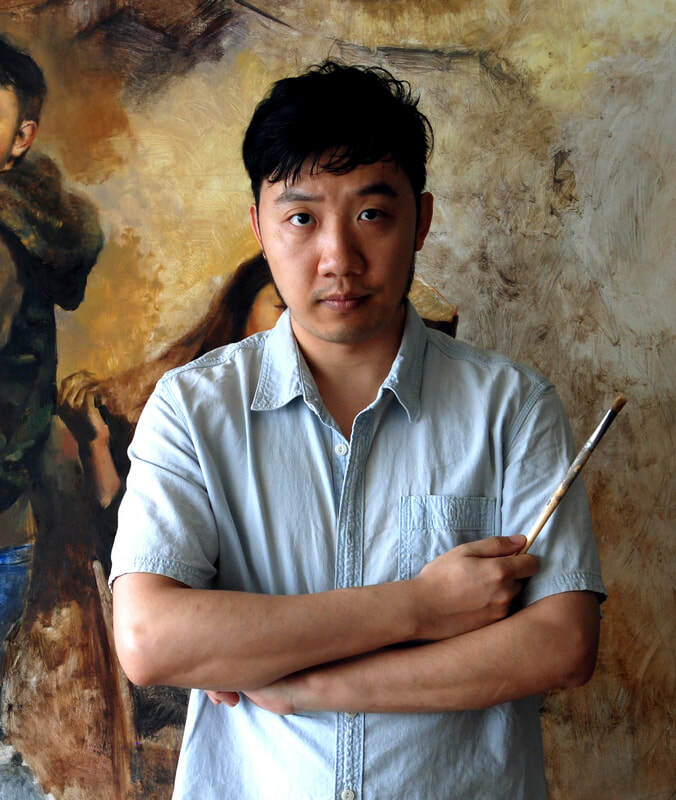 - Year 2009 the oil painting "Burning Soil" won the Earl of Cromier Scholarship Awards (UK) and was exhibited in Sichuan Art Museum. - Year 2011 the oil painting "Seismoscope" was selected to the Culture in Jiangnan "My land and My People" National Fine Arts Exhibition, held by China Artists Association, and was exhibited in Zhejiang Art Museum. - Year 2013 the oil painting "Paper-cutting Girl" was exhibited in "New Realistic Oil Painting" Exhibition of HIHEY Art Gallery. - Year 2013 the oil painting "Burning Soil" was on display in the joint exhibition in Enjoy Museum of Art in 798 Art Gallery District. - Year 2013 the oil painting "The Seismoscope" was on display in "E-JingHua 2013" realistic painting joint exhibition in the Times Art Museum in Beijing. - Year 2013 the oil painting "Past Days", "Passing Scenario", "Girl in the Museum", etc. were on display in the Art Expo in National Agriculture Exhibition Center. - Year 2014 the oil painting "the Blue Charm" was on display in "E-JingHua" Exquisite Realistic Oil Painting Exhibition, in the Imperial Art Museum. - Year 2014 the oil painting "Expectation" was selected to the 12th National Exhibition of Fine Arts, China, held by China Artists Association, and won the Golden Prize in Hubei Province Art Exhibition, and was exhibited in Zhejiang Art Museum. - Year 2015 the oil painting "On the Other Shore" was on display in "Art Tangshan" Realistic Oil Painting Invitational Exhibition. - Year 2015 the oil painting "Love for Life" was exhibited in the "E-JingHua" 2015 Realistic Oil Painting Joint Exhibition in Times Art Museum in Beijing. - Year 2015 the oil painting "Expectation" was selected to the Footprints of Times: Art Exhibition in Nanjing China 2015 held by China Artists Association. - Year 2015 the oil painting "Return from Fishing" won the Excellence Prize in the Wu Guanzhong Museum of Arts, Nationwide Art Exhibition 2015 held by China Artists Association. - Year 2015 the oil painting "Fishing Break" won the Excellence Prize in the "Silk Road, Fantastic Gansu": 9th Western China Nationwide Art Exhibition on the Love of Earth held by China Artists Association. - February, 2016 the oil painting "Dimmed Night" was invited to the be on display in the Art Salon Invitational Exhibition 2016 held by Rongbaozhai Wuhan, alongside with famous artists Leng Jun and GuoRunwen, in Wuhan Art Gallery. - 2016 the oil painting "Seasons when awaiting you" was on display in the Youth Art Exhibition in Bridge Gallery in 798 Art Gallery District. - Year 2017 the oil painting "Leisurely Days" won the Excellence Prize of China (Nanchang) Military Art Exhibition held by China Artists Association. - Year 2017 the oil painting "Under the Sun" won the Excellence Prize of China National Art Exhibition of the 10th west side art held by China Artists Association. - February, 2017 five oil paintings of "YEYU Series" were on display in the ArtSpace Oil Painting Invitational Exhibition 2017, held by Rongbaozhai Wuhan, alongside with famous artists Leng Jun and GuoRunwen, in Wuhan Art Gallery. - July, 2017 the oil painting "Golden Branches and Jade Leaves", "When Joy's Coming", "Tian Ye", were invited to be on display in the Focus on China: Youth Contemporary Artists Exhibition. They were exhibited in the Palazzo Velli Expo Gallery in Roma(piazza di Sant'Egidio 10), alongside with works of famous Italianartist Carla Nico, and Andrea Fogli, the professor of the sculpture department in Accademia Belle Arti ROMA, and Turkish artist Lsikozcelik. - 2017 oil painting < the story about artists> was published on American International Artists magazine issued 114. - 2017 oil painting <sister wearing the Chinese blue and white> won the award of “Best in show“ in the 39th annual international figurative art competition in Salmagundi Club in 5th Ave. New york city. Which prize of Best in show was taken is the first Asian person won till now. - 2017 oil painting <the story about artists> won the selected awards of the 9th International Figurative Art competition in Barcelona, held by MEAM museum and ARC Gallery. This big competition judged by master Antonio Lopez, Nicola, etc. The selected works exhibit in MEAM museum in Barcelona and ARC in America till 2018. - August, 2017 Three oil paintingsof "YE YU Series" was invited to be on display in "THE RULES-Two Orders: China Contemporary Youth Artists Nomination Exhibition" in Beijing SK Tower. - 2017 oil paintings <YE YU series> was invited to be on display in “Sparking Space: Chinese and Japanese modern artists invited art exhibition”, in Ishikawa Gallery, Ginza, Tokyo. - 2017 oil painting <The Dream Seeker> won the First Place of figurative oil human in AMERICAN ART AWARDS.<The story about artists> won the 4th Place of figurative oil human in AMERICAN ART AWARDS. - 2017 oil painting<the story about artists> won the Ridgewood Art Institute Award held by The American Artists Professional League of 89th Grand National Exhibition. - 2017 studied in Master Odd Nerdrum oil painting workshop and had self-portraits exhibition in Florence together with Master Odd Nerdrum. - 2017 oil paintings<the Garden of Eden> series exhibited in Beijing world art center gallery. - 2017 join the exhibition of Artspace professional artists annual exhibition in Wuhan Art Gallery. - 2017 oil painting <Hope> won the Narrative Excellence Award held by the American National Oil& Acrylic Painters’Society of 2017 Online International Exhibition. - 2018 oil painting <Self-portrait> was selected award in Royal Society of Portrait Painters annual portraits competition and exhibited in London at Mall Galleries. - 2018 three works were selected by International 13th ARC competition in U.S.
- 2018 oil painting <The Blue> was selected award in international ModPortrait 2017 competition and exhibited in Museum IAACC Pablo Serrano and MEAM in Spain. - 2018 Oil Paintings of series《When Happiness Comes》invited to exhibit in “Conception and Knowledge”Chinese Realistic Artists Exhibition Tour in Paris - Galley 1618 and Shanghai Xinhua Museum. Together co-exhibited with master Leng Jun and RunwenGuo, MangyaoXu’s works.